The PJ Fishing fleet is fully equipped with new & good quality gear. Both vessels differ in size & make, however both cater for great fishing. Milika II is rigged for light tackle fishing, bottom bashing & is limited to inshore trips as well as on the outer fringes of the main barrier reef (weather permitting). Milika II is surveyed for 8 passengers & fishing is via stand-up rigs. Milika II is a very robust home grown style 28’ centre console islander vessel powered by a 150HP Mercury engine and was locally built in Suva. Watch Dog is a 25' Ramco vessel also equipped with quality fishing gear, up to date electronics, together with being a fully sheltered vessel it is suitable for island hopping trips & island transfers. Watch Dog is a New Zealand built vessel & is surveyed for 10 passengers, and she is powered by a 200HP Yamaha engine. 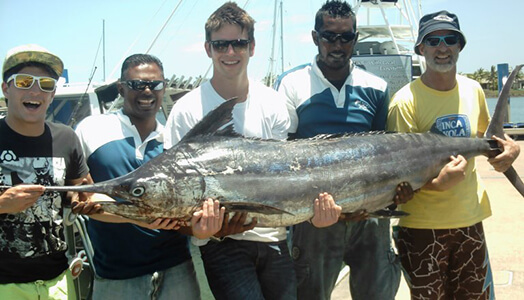 Watch Dog provides similar fishing services as Milika II & is ideal for group charters whether it be a transfer to the islands, island hopping trip or fishing; we will provide a safe & enjoyable trip. All boats can target inshore shallow-depth species such as Mahi Mahi, Wahoo & Spanish Mackerel; casting for GT's, & hand line fishing for reef fish such as Coral Trout. Milika II is equipped with quality gear and up to date electronic equipment to help you get the big catch. 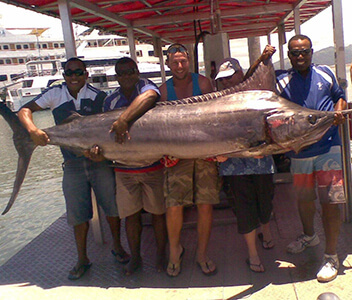 Watchdog is also capable of fishing the edges of the main barrier reef for those GTs, yellow fin Tuna & Marlin. All fishing gear is well maintained. 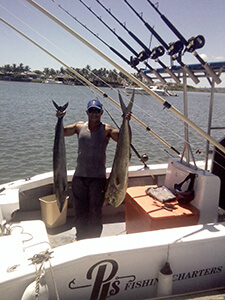 Both vessels are manned by expert friendly crew who have awesome local knowledge of the best fishing spots. 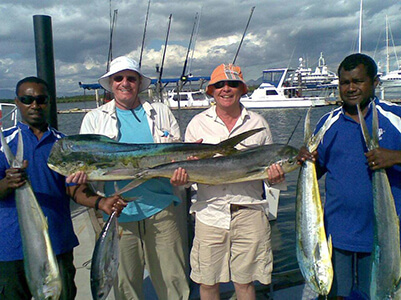 Our Captains have been fishing for several years, & with their friendly professional nature guests have a memorable trip.